Today in Pride and Prejudice-Have you heard the news? This is a who-knows-how-many part series where I go over Pride and Prejudice, writing about its plot points as close as I can to the date they would have happened on. 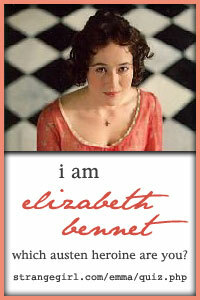 This is the first post, starting on Page 1. Who here remembers Mrs. Bennet telling Mr. Bennet about Mr. Bingley? “My dear Mr. Bennet […]… Continue reading Today in Pride and Prejudice-Have you heard the news?